1. Process - Process is what the operating system uses to facilitate the execution of a program by providing the resources required. Each process has a unique process Id associated with it. You can view the process within which a program is being executed using windows task manager. 2. Thread - Thread is a light weight process. A process has at least one thread which is commonly called as main thread which actually executes the application code. A single process can have multiple threads. 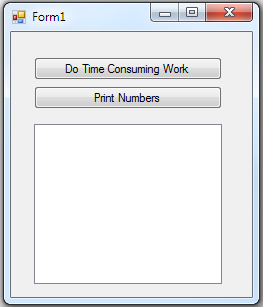 Multithreading Example: Create a new windows forms application with 2 buttons and a listbox control as shown in the image below, and set the following properties. 2. Now when you click "Do Time Consuming Work", the first 2 lines of code to disable the button is executed. As a result both the buttons are disabled. // executing the time consuming method to it. // rest of the code and our application is more responsive. Hi, Venkat sir If possible please share some tutorial on window form connectivity.. Thanks Venkat. Earlier it was very dififcult concept for me. If i copy code and paste code into the my visual studio 2010 i am not getting numbers in to the listbox.